I've known Suzy since 1982 when we toured Mexico together with The Ozone Ramblers and before either of us had made the move to Nashville. When we first met she was making her living performing as a solo act, just her and her guitar and touring all over the West and the Midwest. By 1985 I had already moved to Nashville and right after Suzy relocated, we went into the studio and recorded together so we go way back. In 1986 she got "discovered" and signed by Capitol Records, a relationship that lasted almost 15 years. Roll the clock up to 2011 and she's a platinum selling recording artist, having released 13 albums, toured all over the US and a dozen other countries, wrote a lot of great songs, and established herself as one of the finest artists in American music. Her latest album, "Sweet Danger", was recorded in New York City and co produced with famed keyboardist and producer Jason Miles. 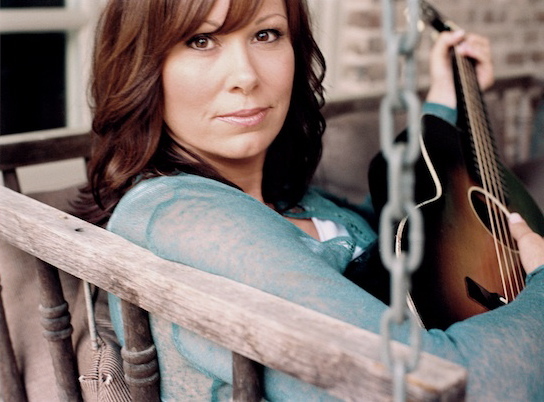 Meet Suzy Bogguss. Bronson: Suzy, thank you for doing this. Suzy: Well it's great to talk to an old friend. Bronson: You're getting ready to go to Memphis for the Folk Alliance? Suzy: I am. I'm so excited, it's my first one. It's gonna be great. Bronson: Well they're gonna love you up there. Your last project that you did, I haven't talked to you in so long. I know you went to New York City? Suzy: Right, I did. One of the coolest things about doing this for as many years as I've been doing it is the collaborations and people that you meet along the way, I mean even like you for instance. It's like sometimes you meet somebody and you have a chemistry and you don't even know why or what it is about this person but you just have something that you need to do together. Jason Miles is a great jazz producer. He played with Miles Davis and Luther Vandross, and he made a lot of real famous records. He produced Chaka Khan and people like that, and he had asked me to do a little project called "Blue Suede Sneakers", they were all Elvis songs. I was pregnant with my son at the time so it's been 15 years since I did the project with him. A couple of years ago I was playing in New York City which is where he lives and he come out to the show. I had just finished the "Swing" album and we were doing that music that night, and he said, "Oh my gosh. Now you're doing swing music, what's next?" I just looked at him and said, "I don't know, what are you doing?" (laughing), so it just sort of sparked this crazy sort of, both of us kinda got the deer in the headlights look and you know just sort of went, oh, what's happening. He said, "Yeah, well send me some stuff." I ended up sending him 3 songs and he liked them. He tried to find some material for me too but we kind of came from such a different background that it really worked out better for me to pick the material since I was the one that was going to sing the lyrics. That was kind of it in a nutshell. As soon as we made that plan to try something. I went to New York and he got all these New York cats that he plays with all the time, so I just let him pick the band. We went into the studio and it was scary as heck, but I came out with some stuff that I really liked a lot and then I went home and wrote the rest of the record with some friends of mine here in Nashville. Bronson: So how did you come to call it "Sweet Danger"? Suzy: Well that was from that meeting. We were having dinner and I just looked at him and said, "I don't know, what are you doing? ", because it was sort of like that thing where I opened up the door to a situation that was pretty scary to me. The thing about that is that I kind of have to force myself to do things like that 'cause I have a little Suzy Homemaker personality deep inside of my midwestern heart, but when I do those things I always get excited and I realize that there's gonna be some parts of it, some angles that are not going to be comfortable and I'm going to have to stretch a little bit here and there. Then I always get done and I go, oh, I'm so glad I made myself do that. Bronson: Well basically that record is Jazz? Bronson: Your Mom, didn't she sing Big Band and Jazz? Suzy: Yeah, she's still singing it. Matter of fact she just did a show at 88 years old, she just sang "My Man", up in the place that she lives. She lives in one of those little condo unit places, that's like a cruise ship you know. She just got up and my niece accompanied her and just wowed 'em. She had false eyelashes on, the whole thing. She was a hot number (laughing). Bronson: Wow. Well I remember you telling me one time that when you first started singing, your mom was always singing around the house and you had a love for that kind of music. Suzy: Yeah, on Saturday mornings we would clean the house together. My siblings are all a little bit older then me but once they left my mom and I'd be cleaning the house on Saturday and she would always have either Doris Day or Ella Fitzgerald, or somebody on the record player and she'd be humming along with that real sweet, where they hold the vibrato off till the very end of the phrase. I always used to practice that. You wouldn't let the vibrato go through the whole phrase, kind of like Frank Sinatra. You just let it go at the very end of the phrase and somehow it makes the lyrics so clean and then you get that little bounce at the end of the phrase and it just makes it magical. Bronson: Well you sing so great anyway, you can sing anything and you've proven that. So you come to Nashville and you get signed to Capitol Records and you're doing Country Music. Suzy: Right, well you know the Folk Alliance thing. I was just noticing when I looked in the book how many of those people I know. I haven't seen them for a really long time but that's really where I started was up in Chicago and Minneapolis in those little folk circles and work my way into an opening slot for somebody else. That was kind of underlying in the music that I was doing but I always have liked a lot of different styles, but I came to Nashville because I love story songs. I just absolutely love them. I love to tell a story and feel like I just communicated something to somebody and then get their response, and then we share that moment together. We've communicated and sometimes we feel it exactly the same way and sometimes we don't, but I just love that story thing and that's what Nashville's about. Bronson: What was it like working with Chet Atkins? Suzy: You know it was fabulous. It was one of those things that just sort of creeped up on us. We met on Ralph Emory's show and we started getting to be friends when I had my first 45 single on Capitol and I brought it by his office to play it for him because it was "I Don't Want To Set The World On Fire". That's an old 50's swing tune and I thought he would really like it because he had such a huge hit with "Mr. Sandman", so that kind of struck our friendship up and then I'd come up once in a while just to visit him and he'd pull out those old fake books that they had during the war. Just all these great old songs that I remembered from my mom singing them and from cowboy songs to "I'll Be Seeing You" to everything and we'd just sit there and jam. Not that I was playing the guitar, (laughing). Bronson: You play guitar real fine. Bronson: That was "Simpatico", right? Suzy: "Simpatico", right. You know we'd get in there and he'd play one pass through and then he'd pick up another guitar or he'd start working on the saddle on that guitar, and he'd be like, " You know this things not playing right in tune." and we're in the studio at his house (laughing) so he'd just walk over to his bench and start working on his guitar and then an hour and a half later he'd say, "You know, I don't think this guitar is the right one for this song." but the guitars sounding good (laughing). There were some frustrating moments but I wouldn't trade anything because that was all part of the cruise that I was on with him. It was just so great that he was that comfortable with me. That he didn't feel like he had to hurry or you know, pick, pick, pick, we've got to make a record right here. Bronson: Well those are some fabulous memories. Suzy: Oh my gosh, yes. Seriously I think about him almost every single day, there's something that happens where I think, oh my God he would have gotten such a kick out of this, 'cause he had a really crazy, dry sense of humor. Or I think, that sounds like something Chet would have said, 'cause he had a handful of "chetisims". Like he would say, "I know that's right", he used to say that all the time. One of my favorite memories is at a concert we did. We were standing at the mics and he said, "Here's a song that Suzy and her husband wrote." and I said, "And you. You wrote the music and that's sort of important to a song." (laughing) I looked at the audience and I said, "He's just so modest. It's unbelievable that he could be so modest." He got up on the microphone and he said, "I got a lot to be modest about" (laughing). That's how great his sense of humor was. Bronson: You were on Capital 15 years right? Suzy: Close to that yeah, a long time. It took a little while before things really got off the ground. Back in the day they used to develop artists and kinda give you a chance to figure out who you were on vinyl and on tape I guess. You know I did some pretty crazy experimentation in the beginning. The first thing I did, I did with Blake Mevis and that was like kind of old fashioned, almost like a Patsy Cline record. The very next record I did with Wendy Waldman from LA, and we did like 5 or 6 sides that were way ahead of what was going on at the time. It was very very pop. Kenny Greenberg on guitar and Josh Leo. My lack of accent allowed me to sing that pop stuff, even though I have no grit. You know I can't sing rock or anything like that but this pop stuff, it was very kind of progressive at the time and we turned it into the label and they just kind of looked at us like, "What are we going to do with that?" (laughing) The label head at the time was Jim Fogelsong and he said, "Do you remember when I came to Dollywood and saw you singing at the train station and you had your guitar and you were singing songs. That's who I want to hear, I want to find her." So that's who we found. That's how I ended up doing that first record, "Somewhere Between", and it was a little bit of my cowgirl self that had traveled in the west. It was a little bit more folky, a lot more acoustic guitar. It had a lot of upright bass on it and that kind of stuff, but really it was sort of folky, really. Bronson: What year was it that you started Loyal Duchess Records, your record company? Suzy: I started it in 2001 with a Christmas album and then in 2003 I went down and did a record in Austin with Ray Benson. Bronson: And what was it like working with Ray? Bronson: Asleep At The Wheel. Bronson: That ain't true, you know that ain't true. They loved you but I understand what you mean. Suzy: No, they did not love me (laughing). That was a hard opening. They wanted to dance and really rock out and I'm up there going like, "And then I had this other boyfriend who broke my heart. This song's for him." (laughing) He came out on the stage one night just outside of Yellowstone Park, we were in this place called Bucks, he came out and bends over, you know he's a real tall guy. He bends down over my microphone and he says, "Come on folks, she's got to get her gas money." (laughing) And then from there on they let me finish my set so I got paid. Then a few more dates with him out there and then later on we ended up on the same record label for a while. When he was doing the Bob Wills project, I got to sing on that with him and it just sorta got us back in touch more, seeing each other more, and I literally just woke up one morning with the idea that I needed to make a record with Ray and called him up and he said he was totally into it. When we started talking that day we really thought it was gonna be a Western Swing album because I'd done the Bob Wills thing, I love that music. You know I yodel and all that stuff and we just figured, hey, it's going to be Suzy with Asleep At The Wheel, and I just stumbled onto this songwriter in Nashville. I was at F. Scotts one night and she was singing and she was singing songs that she had written herself, that really smacked of all the old early 30's and 40's and that great swing sound. They were so clever and fun and witty and the lyrics were just awesome. I sent him a few of those songs by April Barrows and he just fell in love with them but he goes, "But Suzy, this is Jazz. This isn't what we were talking about." and I said, "I know, but isn't it great? Why can't we do that?" So I brought them down and we ended up cutting at least 4 of April's songs, if not 5. And then my fiddle player at the time, Paul Kramer, had a bunch of fresh swing songs too so the "Swing" album ended up not being much of a cover album at all. I think we did 3 or 4 cover songs on there in 12 songs. It was pretty great, really fun working with him and everything was cut very live. In fact we were all in the same room, all of us except the bass player and the drummer, they were in rooms off the side. The piano player and Ray and I were all in the same room and we just had big giant wedges of foam between us so I could hear everybody and we ended up keeping a lot of live vocals because we just grooved because we were all playing together you know. Bronson: You cut that in Austin? Suzy: We cut it at Ray's studio in Austin, yeah a really great place. He's got a top notch studio there, he's got all this really old analog equipment so you get all that warm fuzz. It's sort of a very forgiving studio, the analog thing kind of gives it a little extra warmth I think. Bronson: I love analog. Everybody's digital now but you can't beat the analog, it's got that bottom. Suzy: Well even if you record digital and then run it back through the analog you still got some of that good old warm stuff. Bronson: Yeah you bring back in that bottom end. You're getting ready to go the Folk Alliance in Memphis and I know you'll blow them away and you've got a Nashville date coming up here pretty quick don't you? Suzy: I do. I've got friends over at the Station Inn and they've just been so great to offer me to play there. I guess I've been so tickled about that 'cause you know, when I first came to town I would have been terrified to try to get in there for feeling like maybe I didn't have the integrity factor (laughing). Suzy: You know you walk that line between commercial and integrity all the time (laughing). Bronson: It's probably the most famous acoustic only room in Nashville. Suzy: Oh yeah it's so true. You know there's stuff in the walls there. I did a show there, maybe it was last spring or something like that. I was just going to go in there and do it solo but everybody in my band wanted to play there so it ended up like we just did an acoustic set but we ended up playing like for 3 hours, absolutely all of us just having a blast. It's not like we didn't play together a lot, we play together all the time but it was different there. It was a vibe. It's just there's something about what happens in the walls and everybody was so loosened up. I guess in a way it's almost like a living room performance because the audience is so much a part of it that it's almost like a house concert. Visit Suzy online at www.suzybogguss.com and see her perform at the Station Inn in Nashville on Thursday, March 10th, at 9:00pm.